Hippos are known for their voracious grazing habits, but evidence suggests these mega-mammals occasionally turn their backs on a vegetarian diet and opt for something a little meatier instead – like a fresh antelope carcass. The latest case of carrion-craving hippos comes to us from South Africa's iDube Game Reserve, where ranger Rob Vamplew filmed a hippo chomping on the remains of an impala (while looking particularly sinister in the glow of game-spotting torches). The impala had been chased into the water by wild dogs earlier in the day and eventually fell victim to an opportunistic croc (a storyline that we've seen play out before in the African bush). That's when things got a little weird. 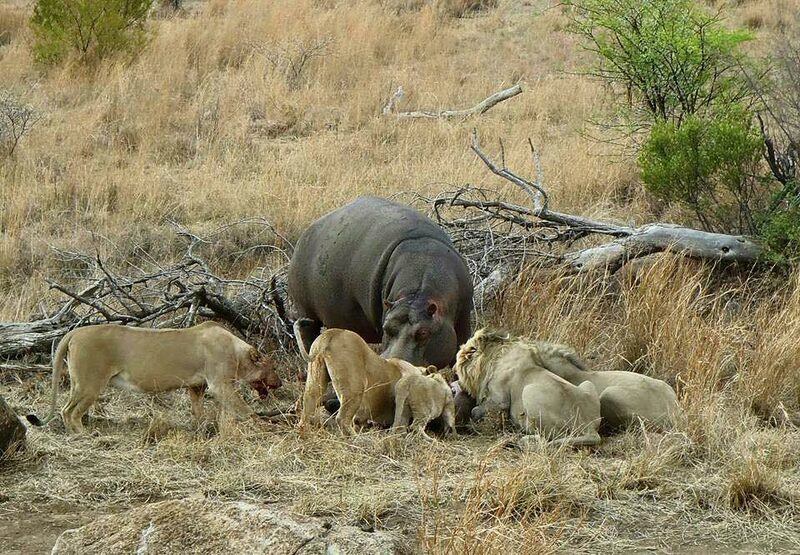 "The hippos then fought amongst themselves for possession of the carcass," Vamplew explains. "The croc was still in the water waiting for an opportunity to reclaim some meat and the next morning it did manage to grab a bit back." Hippos are viciously territorial, so it's possible these battling behemoths were simply defending their turf, rather than trying to nab the croc's meal. A splash in the water is usually enough to attract the attention of a pod, and dominant bulls will confront anything they perceive as a threat. However, Vamplew is confident that at least one of the hippos was actually feeding on the carcass, and this type of behaviour has been observed before. Dr Joseph P. Dudley of the University of Alaska recorded the first known instance of hippos eating meat in Zimbabwe's Hwange National Park back in 1995. Since then, reports of hippos-turned-carnivore have been trickling in, and Dudley has kept close tabs on them. Just last year, PhD candidate Leejiah Dorward of Imperial College London published a paper detailing what is believed to be only the second confirmed account of hippo cannibalism (TWD … hippo-style). Much like cows, hippos have chambered stomachs that work like fermentation factories, breaking down grass and extracting necessary nutrients. To maintain those ample figures, they can munch up to 40kg (88lb) of plant matter every evening, before retreating to the safety and coolness of the water to digest their meal. In this scenario, meat doesn't seem like a dietary requirement – so why would a herbivore with an anatomy perfectly suited for grazing occasionally go rogue? Scientists are still trying to answer that question. Hippo expert Dr Keith Eltringham believes the species is driven to scavenge meat only when grazing becomes scarce (during a drought, for example). Dorward agrees, suggesting that hippos may also show other behavioural changes during such times: "If carnivory is driven by dietary deficiencies in hippos then they may become more dangerous during droughts or other times when their access to food is restricted." For Vamplew, the impala-eating hippo encounter was a first, and he suspects the unusual snack choice may be linked to a severe drought that has plagued the area in recent months. Without enough rain, grazing animals are forced to complete for food at an unsustainable rate and this can trigger some unusual behaviour. "I have previously seen [hippos] ignoring crocodile kills," he adds. Although reports of meat-eating hippos have surfaced only in the last twenty years or so, Dudley suspects the animals have been eating carrion all along, and the behaviour has simply been overlooked. "This is something that has been going on since there were hippos; it's not new simply because human beings discovered it was happening only recently," Dudley told BBC Earth. 2,000 kilograms of dead hippo for dinner? Not a problem.